Organiser: The contest is hosted by Kamla Nehru Institute Of Technology, Sultanpur. Prizes: Prizes worth Rs. 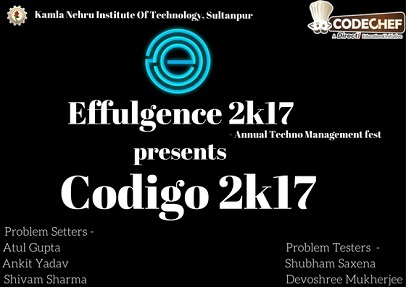 10,000 for top performers of KNIT Sultanpur and Codechef Laddus for global top perfomers. Please contact atvicsh@gmail.com for any queries during the contest. Codechef laddus for all top performers. Prizes worth Rs. 10000 for top performing KNIT Students.